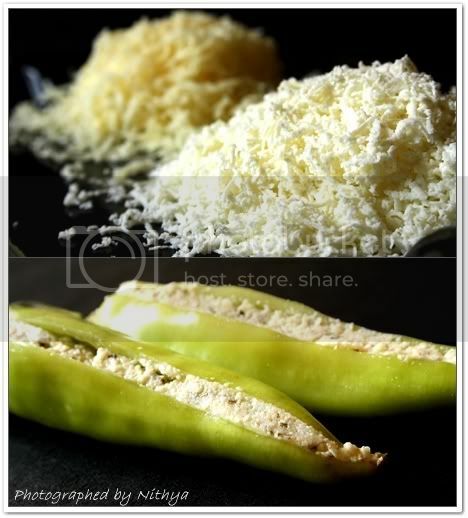 The chile relleno which means "stuffed chilli", is a dish that originated in the city of Puebla. 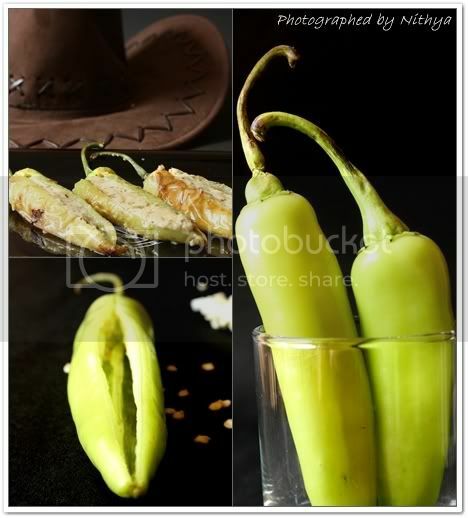 It consists of a roasted fresh poblano pepper (a mild chili pepper named after the city of Puebla), sometimes substituted with non-traditional Hatch green chile or even jalepeno chili pepper. It is stuffed with cheese, or picadillo meat made of diced pork, raisins and nuts, covered in an egg batter or simply corn masa flour and fried. Although it is often served in a tomato sauce, the sauces can vary. Slit the chilly neatly from top to bottom and deseed it using a spoon. Rinse them in cold water and keep them aside. Grate required amount of cottage cheese as well as cheddar cheese. Put them in a bowl, add herbs and just a pinch of salt. Mix them well. Now stuff just enough of cheese mixture into the chillies. Shallow fry them on a flat pan until the chilly gets roasted. Slightly turn them in intervals to get the sides of the chilly cooked. Do not turn upright. Remove them from the pan once it gets roasted on three sides. Garnish with pineapple salsa. Serve them with tomato sauce and sour cream. 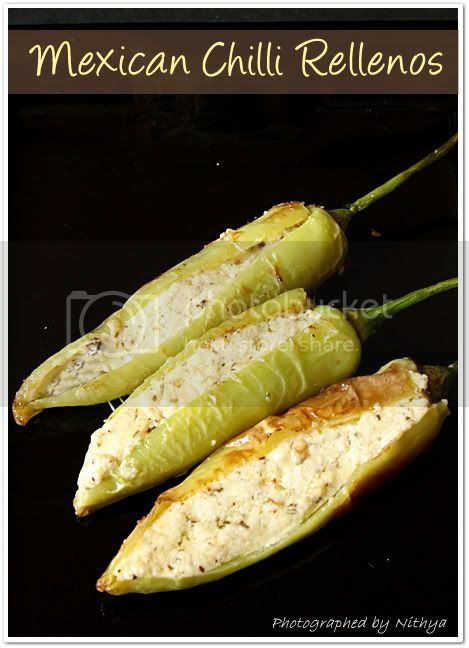 The more sinful version is to make a batter of all purpose flour, salt and water and dip the stuffed chillies in them and roll them on bread crumbs. Then deep fry the batter coated chillies to make crispy relleno. Wonderful relennos and a good sumup of the dish. Hat kkulla irukkaradhu yaaru? Is it u? Love the last pic ;). the Relenos are soo yummy Nithi. :D :D.
I used to visit this place next to Copper Chimney I guess it was Don Pepe. Love the mexican food and the chilies are surely scrumptious. These are of course quite popular here - but yes, they are fattening! The city I live has a bountiful of great mexican restaurants maybe because we are only about a few hrs from Mexico! You'll love it - so visit soon! Love the pictures Nits! Love Mexican food...Great relleno and pictures Nithi..
this will be a hit menu for sure! 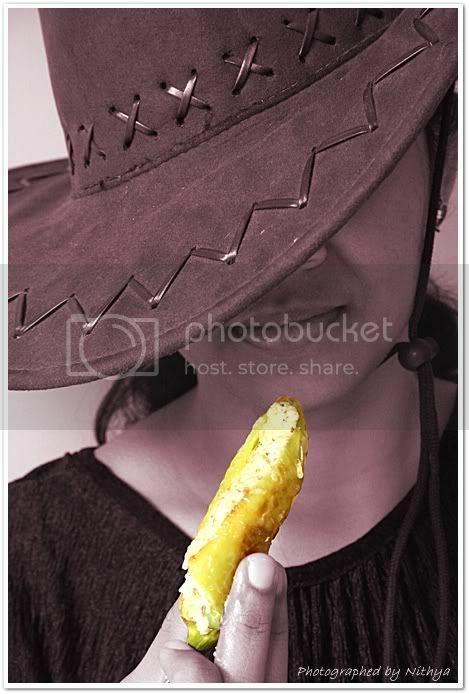 Love that cowboy hat and the lipstick color. It is totally drool worthy. Oh these look gorgeous!!! Bookmarked! delicious and mouth watering rellenos with a detailed demo. rellenos are too gud nithya! really pictures are amazing...love the cowboy style hat.superb! Those chillies are just amazing! Thanks for sharing. 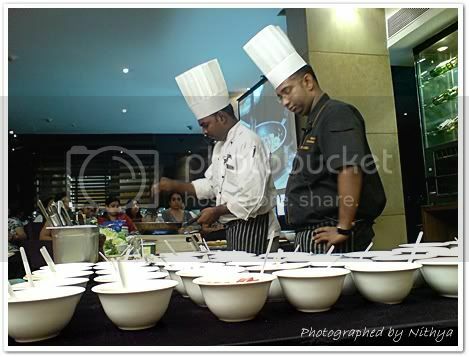 Lovely clicks as well! Vah Reh Vah!! Soooooper doooooper doooooooper!! 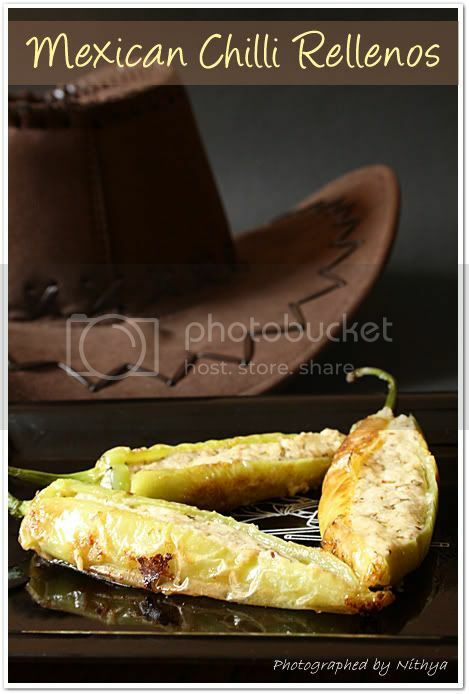 chilli relleno looks awesome nithya....wonderful click dear! I love your photo with the cowboy hat!!! !